On Tuesday afternoon, the Elizabeth River Project held a ribbon cutting ceremony for the recently completed Fred W. Beazley River Academy. The academy is located at Paradise Creek Nature Park, a 40-acre environmentally focused park created through a partnership between the Elizabeth River Project and the City of Portsmouth. The Elizabeth River Project is a non-profit group leading community efforts to restore the environmental health of the Elizabeth River and to affirm its value to the region. The Elizabeth River, a tributary of the Chesapeake Bay, is home to world’s largest Navy base and world’s largest coal exporting facilities. This industrialization, combined with the urban and suburban cities that make up the watershed, created one of the most polluted rivers on the Chesapeake Bay. But with the collaboration of local businesses, citizens, schools, and government working together through education and restoration projects, a spirit of environmental stewardship took hold in the community. Today, the pollution has reduced drastically, and marine habitats have increased significantly, with the recent return of sea horses and river otters to the river. 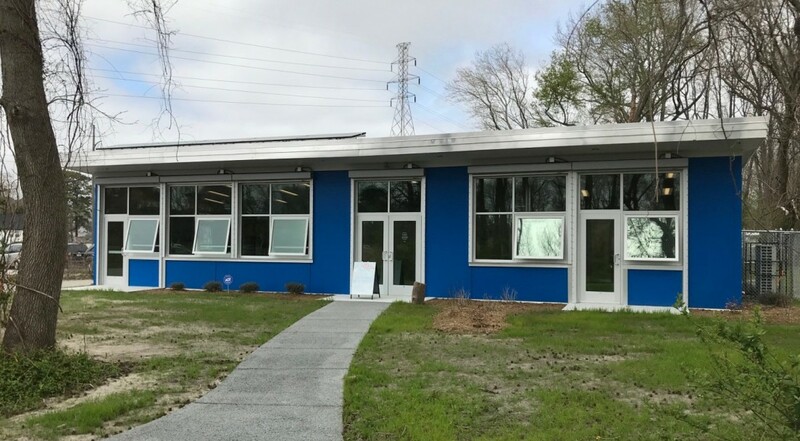 The Fred W. Beazley Academy offers an enclosed classroom and workspaces for the Elizabeth River Project’s education team to further its mission to teach people of all ages the wonders of restoring an urban river to environmental health. The building was designed by RRMM Architects and design consultant Michael Petrus with CRISMAN+PETRUS architects. While not LEED certified, the Academy models green building practices through many substantial sustainable features. Twenty solar panels generate up to 6000 watts of electricity— more than enough to power the estimated building needs throughout the year. Operable windows, roof overhang, ceiling fans and concrete floors further reduce energy needs by helping to keep the building cool in the summer and retain heat in the winter. Large windows provide natural lighting. Multiple design features focus on water conservation. Dual-flush toilets conserve water by using only half the water of traditional toilets. All rainfall stays on site through the combination of 1,150-gallon cisterns for re-use in water landscaping and a 1,000-sf rain garden. Sidewalks, parking lots and entry roads are pervious, preventing run-off pollution. Native foliage is planted around the building and throughout the park, providing habitats for native wildlife and reducing the reliance on water and fertilizer. The building is modestly sized to limit its footprint. It is constructed from sustainable building materials such as birch plywood certified by the Forest Stewardship Council as being harvested from responsibly managed forests. It was designed to minimize construction waste, avoid volatile organic compounds, and demonstrate high-efficiency heating and cooling. A small, sustainable classroom located on a sprawling site, the Fred W. Beazley Academy will play a key role in inspiring and educating the future environmental stewards of the Elizabeth River, further bringing back to life the birthplace of America’s maritime industry.